Designed for snag-free fishing in both fresh-and saltwater environs, the SnakelockZ allows anglers to fish swimbaits, shads, worms, or craws through all types of cover thanks to is streamlined, bullet shaped head and weedless design. Armed with beefed up components like heavy duty Mustad UltraPoint hooks and a stainless through-wire, SnakelockZ sport the guts to stand up to bruising saltwater gamefish and heavy cover combat. 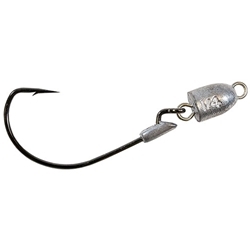 Each hook features a molded keeper that prevents soft plastics from sliding down the shank on missed strikes and hard casts, and the lead head itself is engraved with the jig weight for easy identification on the fly.